Ecolise > NEWS > General news > How does your worldview affect your sustainability solutions? How does your worldview affect your sustainability solutions? 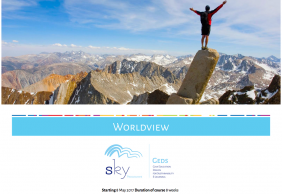 (25 April 2017) – Find out how your worldview and value systems affect your perceived needs and how you propose and design solutions by joining the 8-week Worldview dimension of Gaia education’s ‘Design for Sustainability’ E-Learning programme, starting 8th May. Learn to identify a series of valid perspectives, worldviews and value systems, and put them into context with each other – rather than seeing them as mutually exclusive or contradictory, in order to take the important first steps to becoming able to facilitate the complex multi-stakeholder dialogues upon which the local, regional and global transition to sustainability and regenerative cultures will depend. Sign up here to join the 8-week course starting 8th May.